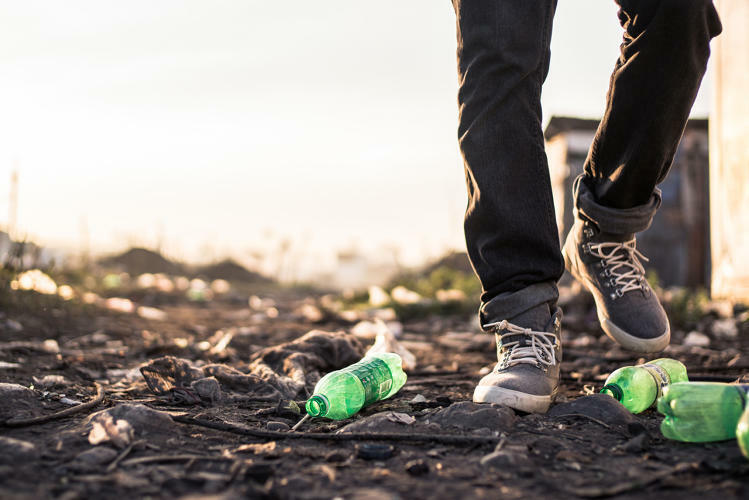 Timberland* recently announced a new line of shoes, backpacks, and t-shirts, made from recycled plastic bottles littering the streets and landfills of Haiti. To launch the initiative, Timberland partnered with Thread, a Certified B Corporation with a process for transforming plastic bottles from the streets and canals of Haiti and Honduras into fabric. But the initiative is more than just a sustainability play: the program employs local Haitians who collect the plastic bottles and sell them to 50 Haitian-owned and operated collection centers, who in turn sell the sorted plastic to Haiti Recycling and Environmental Cleaning Solutions S.A. in Port-au-Prince, resulting in the creation of more than 1,300 jobs for locals. The bottles are then melted and shaped into a fiber fabric for Timberland products. However, this is not Timberland's first foray into materials innovation. Since 2009, Timberland has transformed the equivalent of 233 million plastic water bottles into footwear and in 2015, the company used one million pounds of recycled PET in Timberland footwear. This partnership with Thread will help scale the company's sustainability efforts in new markets. While Timberland could have stopped at simply solving a sustainability issue, it looked at the broader picture when it developed its new partnership with Thread. The companies chose to launch the initiative in Haiti partly because it's the poorest country in the Western Hemisphere, and one that could benefit from additional job opportunities while also finding an economically stimulating solution to remove trash from the streets that could be replicated in future countries. This partnership represents the evolution of recycled materials from a simple supply chain improvement to a holistic approach to sustainable products, which creates jobs, supports income opportunities, and beautifies neighborhoods in Haiti. The Football Association has announced a new brand purpose 'For All', alongside a campaign highlighting the FA's work with women and people with disabilities. Jamii is digitizing health insurance processes, partnering with insurance and mobile banking companies to reduce costs and provide more accessible health care to low-income families. Many in the business community, including technology companies, are still stridently opposed to the ban. Mars' marketing chief says that when it comes to running a successful business and producing strong advertising, diversity should be considered as "the cake, not the icing on it". Honey Nut Cheerios has removed its bee mascot BuzzBee from cereal boxes in the U.S. and Canada, in order to highlight the dwindling numbers of bees. Orvis is working in close partnership with the Everglades Foundation to achieve a long-term solution to the diversion of freshwater overflows from Lake Okeechobee. Danone and Nestlé Waters have joined forces with Origin Materials, a Californian research and development company, to form the Natur'ALL Bottle Alliance. Their aim is to be the first to commercialize 100% bio-based and recyclable PET bottles. New Zealand's DB Breweries company created beer bottle crushing machines that turn empties into a safe sand substitute usable in any industry. Kroger is using a lighter weight, more environmentally friendly milk jug. UPS said it will invest more than $90 million in natural gas facilities and vehicles, including fueling stations, compressed natural gas trucks, and liquefied natural gas vehicles. A new project allows businesses to subsidise and share their office space with community-led ideas and experimental projects. Giving is easier than ever, but what does it mean when our giving is directed toward the most viral story? If you had to guess, how many of the top 500 companies in the United States are run by women? A donor's first donation to your nonprofit is a step in the right direction, but it's not an immediate promise for smooth sailing. After their initial gift, you still have work to do with each donor. That work pays off, though. With increasingly limited public funds being allocated by cities for nonprofit arts and culture organizations, good stewardship of such funds matters now more than ever. This newsletter represents a brief, weekly update of the most pertinent news articles and trending information collected from major daily papers, trade publications, newsletters and other sources. Just click on the headline to be taken directly to the full article and source. (Some require a free or paid subscription.) In order to protect the integrity of each article, we do not edit materials that are reprinted in this newsletter. We hope you enjoy the recap of this content and our insight of the week, but please note that the articles and information contained within this newsletter are intended to be informative and are not necessarily representative of Cone’s point of view. Unsubscribe wdailey@conecomm.com from this list. Copyright (C) 2015 Cone All rights reserved.